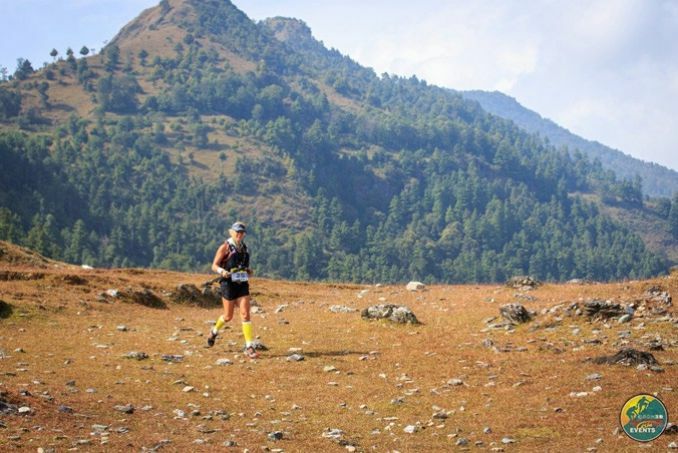 I was not sure what to expect with the Asia Action Event: Nepal 100km Ultra Marathon as it was my first time racing this distance and competing in a multi-day event. I did know one thing though, I sure was nervous and excited, especially traveling by myself and not knowing a single person. The flight from Kathmandu to Pokhara gave me time to get to know others on the same adventure as me and to take in the beautiful views of the Annapurna Ranges. My long life dream was starting to become reality. From Pokhara we then traveled 3 hours to the town of Beni, which was an experience in itself. Once again the views amazed us all as did the conditions of the roads, if that is what you can call them. We finally arrived at Beni, the base of our three-day event. The conditions for the start of the race were perfect. The day started with a quick 400m run through Beni which lead us to our first set of stairs. The climb took us to a little village that gave us our first real taste of Nepal living. After the climb up, the trail leveled off for a while showing astonishing views of the mountains. There was even time to take photos of each other as this was a moment that we never wanted to forget. No matter what pain I felt for the rest of the day, I had these views to distract me. Running through the villages along the trail were another thing. Being welcomed by Tikka blessings, showered by Marigolds, or the local children yelling out “Namaste” bought a smile to my face and are memories that I will always treasure. After checkpoint 2 we started to head back towards the 60km runners. Once again the terrain of Nepal amazed me as we headed towards the rice paddy. A lasting memory is coming eye-to-eye with a bull who was standing right in the middle of the trail. I was not in a rush and I was happy to wait for him to move over a little so I could pass. The remaining 18km of the run was definitely my favorite as was running free on the narrow trails and sliding down some hills. I definitely was on a high. Bring on Day 2!! 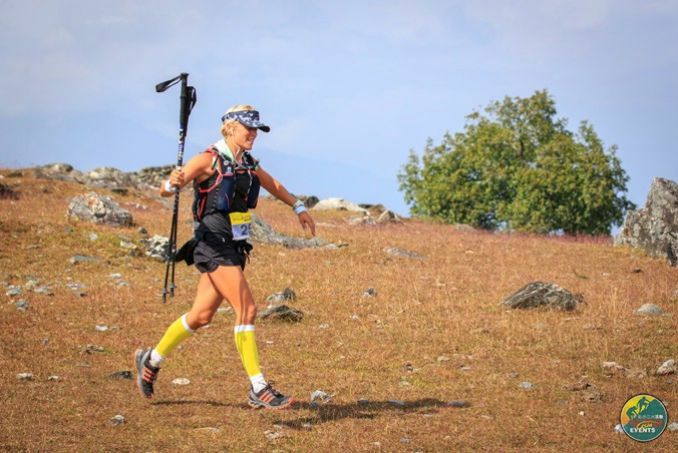 I could not work out whether I was relieved that it was the last day of the race, hoping that my left achilles could hold on for the last 18km, or sad to know that in a few hours my long life dream was soon to be over. The race started with a run (or should I say plod) through the town and across the local sports field to a suspension bridge. From here is seemed that it was straight up again for the next 4km. With every step I could feel my achilles but I was determined that it would not affect me enjoying the last day. After the first 5km the grounds leveled off and I loved every minute of the challenging run though the rice paddys, balancing on rock fences, and running through creeks. I felt alive!! After checkpoint 1, knowing that there was only 8km to go it was back to making our way up a rocky switchback road. I kept telling myself to power up this road and you are home free. Within no time I was working my way down to the finish line. Adrenaline kicked in again as locals cheered and welcomed us into their town. I felt like I was in a 5km race. For some reason my pace really picked up and I was just hoping that this energy could hold on for a couple of more km to the finish line. Reaching the finishing line was so overwhelming. I had done it. 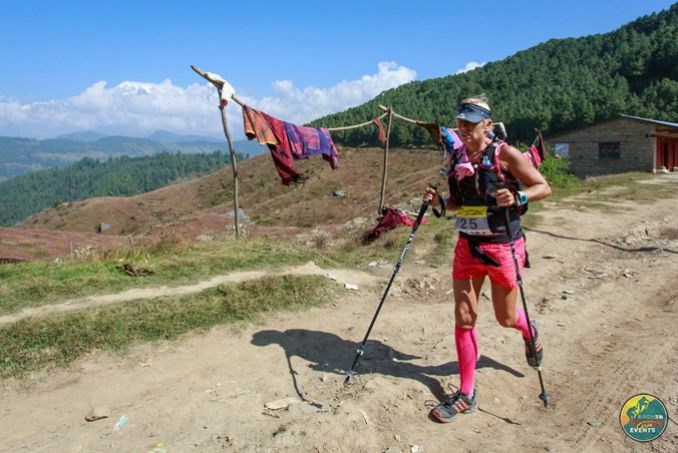 I had finished my first ever 100km ultra marathon and fought some mental demons along the way. I felt invincible!!! 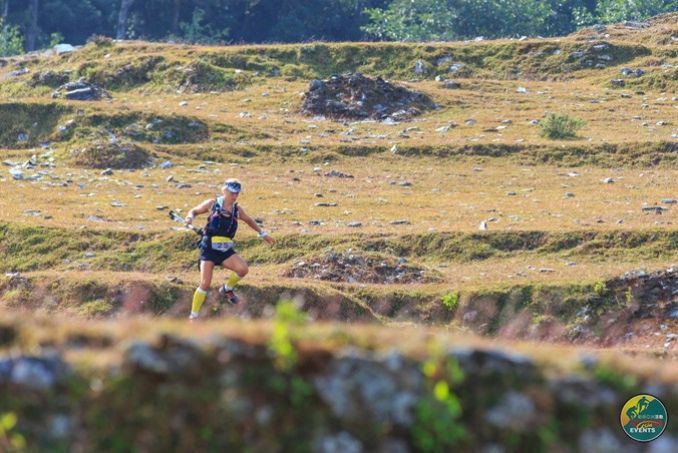 I am not sure weather to call the Nepal 100km a race or an event. My goal was to just finish it but after Day 3 being the 3rd female overall to cross the finish line was such a huge achievement for me. I loved the comradely that was out on the trails. People supporting each other and helping each other was amazing. One thing that I did learn is that if things do not go to plan it is OK. I am strong and I am proud!